There are many beautiful places in Laguna that are often overlooked by tourist who have limited time and simply want to visit the most popular spots in the country. Though there are many towns and cities in the Philippines where there are many tourist attractions, yet they are not recognised because of lack of tourism promotion and ads. LILIW is now widely regarded as the TSINELAS Capital of the country for its footwear making industry where people will never run out of slippers or shoes to wear. The highland town’s origin was said to have come from a bird chirping the words, “Liw, Liw, and Liw.” The town has become a shopping hub for tourist because of the series of tsinelas shops all around. You will be surprised at the wealth of exciting stuff; this little town has to offer. There are some of the best things you can do in LILIW. 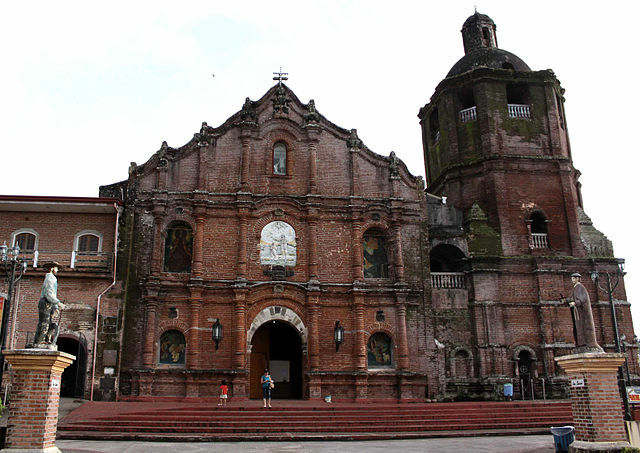 VISIT THE LILIW CHURCH: St. John the Baptist church is a beautiful destination in the town. This Baroque style church has a red facade, whose colour came from the bricks it was built of. These wonderful structure and architectures are amazing to behold especially if you consider that these beautiful buildings were built without the aid of heavy construction machineries. If you find yourself in Liliw, do shop at the Tsinelas lane, to enjoy its cold springs, to have a food trip to have an R&R in a mountain town whatever reasons it may be. A visit to the old church of Liliw is a must. LILIW DINING: it is pleasantly surprising that there are places for excellent dining in this small town called Liliw. There are at least two Chef Mau Restaurants and Arabela Italian Restaurants. Arabela is Liliw’s one and only Italian restaurant. It serves some of the best pasta and pizza. Chef Mau is a fast food restaurant. They present a wide variety of Pinoy style dishes served in an elegant design. THE BATIS AND OTHER ATTRACTIONS: you can experience the mountain streams as you pass through the national highway on the way to the town centre. The resorts here are often built right along these streams and include swimming areas and pools. The most popular resorts are Liliw resort and Batis at Liliw located in Barangays Oples and Laguna. EDNA ARAGONS SHOE FACTORY: A visit to the town of Liliw would be incomplete without a visit to the makers of the footwear which the town is known for. You will find shops and stalls selling new and trendy varieties of slippers, sandals and shoes. All you need to do is to have patience so you can scour these stores for the perfect bargain. You’ll definitely at least one pair of shoes or sandals during a visit to Liliw because the prices are actually cheap. Your feet will love the wide range of styles and the colour of slippers and sandals you can buy to pamper yourself. There is no better way to release stress or to celebrate than by belting your vocal cords out. V3 Karaoke bar is there to let you enjoy without having to worry about the cost. V3 will even heighten that celebratory mood by offering an array of alcoholic beverages and classic beer and snacks. Even for adult, entertainment like the Ringside Bar, Horizon Gentlemen’s VIP Lounge, stags, Mommas and the strip clubs are very famous.